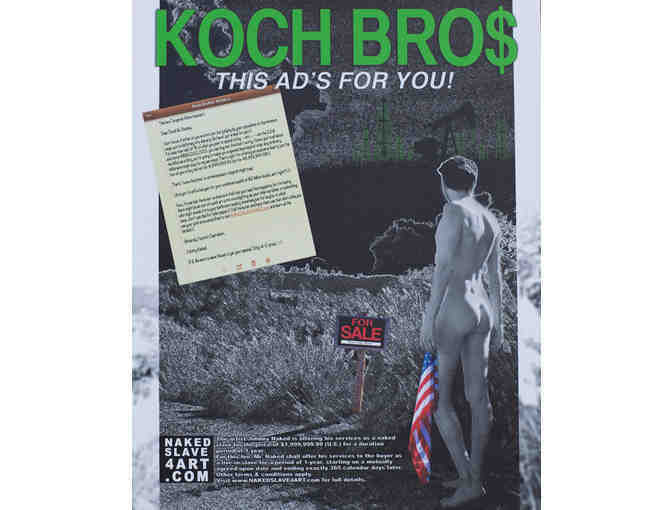 Up for your consideration is this gorgeous and hilarious reproduction of an ad Johnny Naked created as part of his NakedSlave4Art project. 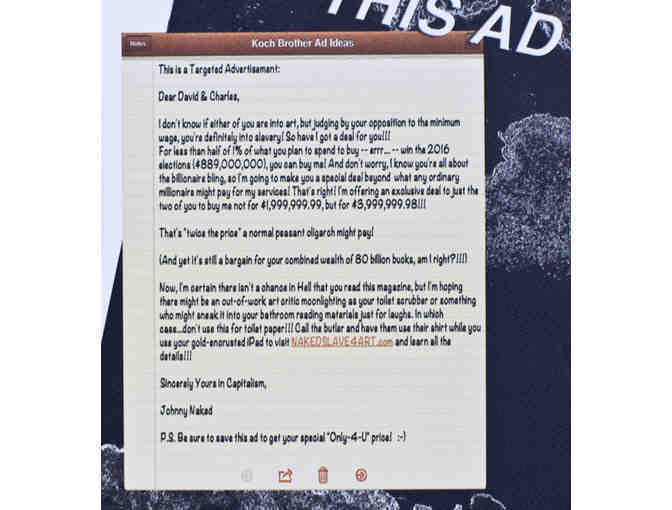 The ad ran in the March/April issue of Artillery Magazine. It is printed on stretched canvas and measures 16"x20". JOHNNY NAKED is a multi-talented artist with a long, established career in the visual arts. He began his artistic endeavors while growing up in the city of Philadelphia, independently honing his photographic and storytelling skills through numerous personal projects. He then went on to acquire his Bachelor of Arts in Filmmaking from Penn State University, where he wrote and directed several short films including SPACE: The Distance Between The Beginning & The End, which was featured at the 25th ANNUAL WORLDFEST-HOUSTON. A prolific visual artist and filmmaker, Johnny's work has been exhibited at galleries and festivals in such cities as Toronto, London, New York, Philadelphia and Los Angeles. He currently resides in Los Angeles, California, making his living as a visual media artist through the crafts of: filmmaking, photography, writing, and acting. Learn more about Johnny here. Your support matters, so Multi-School Fossil-Free Divestment Fund would like to use your information to keep in touch about things that may matter to you. If you choose to hear from Multi-School Fossil-Free Divestment Fund, we may contact you in the future about our ongoing efforts. Copyright © 2003-2019 Multi-School Fossil-Free Divestment Fund and BiddingForGood, Inc. All Rights Reserved. Designated trademarks and brands are the property of their respective owners.